What is the Library Orientation? This Library Orientation is a basic overview of the Library and its resources and services. Follow the steps below to complete the Orientation. NOTE: The Library Orientation is mandatory for all ENGL 101 students. As you take the Audio Walking Tour, you will complete the 2-part Library Orientation Worksheet. OR print it yourself using the link below. The Audio Walking Tour will introduce you to the resources, services, and locations available in the library. 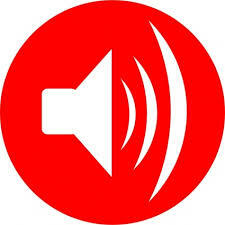 Look for the red Audio Tour signs with the audio symbol in white (see the symbol above). While you are taking the audio tour, answer the questions in the first section of the Worksheet. Borrow an MP3 player at the Circulation Desk. Use your own ear buds or borrow headphones. NOTE: You will need your Student Photo ID/Library card to check out an MP3 player or headphones. Still need to get your CCC Photo ID? Visit the library MON-THURS 9-11 am, 2-4 OR 6-8 pm. Use a smartphone with a QR Code Reader app. Download a free app before you come to the library from the App Store on iTunes or Android Apps on Google play. NOTE: Most iPhones have a built-in scanner app. Just open your camera and scan the tour's QR codes. In the library, scan the QR code at each tour stop. After you've completed the Audio tour, go the link below to take the online Library Website Tour and answer the remaining questions on the Orientation worksheet. Text that is red and bold relates to questions that should be answered on the Library Orientation Worksheet. If you are taking ENGL 101, give the completed Library Orientation Worksheet to your instructor to get credit for completing this assignment. This transcript is provided for students who may have difficulty listening to the audio file. In addition to the Orientation, the library also provides tutorials to assist student with completing their research assignments. Tutorials on: finding books & periodicals, reference sources, the Internet, evaluating information, and documentation of sources.